Kick up your feet and relax on one of these stylish yet practical ottomans. With a vast selection of durable, versatile, patterned and upholstered ottomans in several different materials, you can find an ottoman with a modern, traditional or contemporary design to match your living room decor. And the great thing about these ottomans is that they double as extra seating, storage and decorative living room pieces, so you can rest knowing you got the most for your money. Whether you add a few or just one, ottomans are smaller than most furniture and easily fit into place anywhere in the living room. Some are even short enough to slide under tables or into corners. Because many of these pieces come with built-in storage, they can also de-clutter and open up the space. 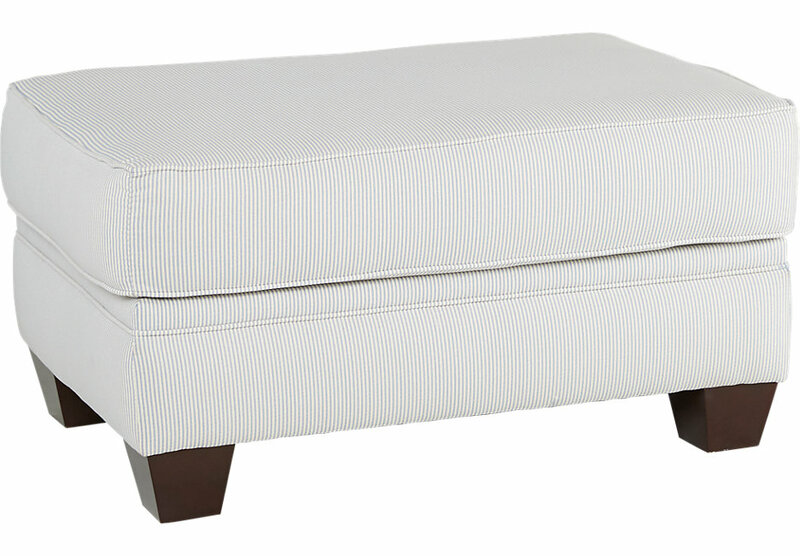 Ottoman prices vary based on fabric, size, and storage space. Before you browse, assess what's best for both your space and budget. For those simply looking to rest their feet, search the cheaper options. If you often host guests and are looking for extra seating, allow a larger budget. To fulfill different functions, ottomans come in many sizes and shapes, such as square, round, or rectangular. Those made with sharp angles and modern, distinct lines are often used as additional seating along walls. Other pieces with unique round shapes can be placed by sofas or in the center of a room to serve as footrests or alternative coffee tables. Ottomans complement the style and color scheme of a room. Since they function as accent pieces, they can be bright and vibrant, adding a splash in a neutral-colored room without overwhelming the space. Or, if you’ve already got a lot going on in the room, ottomans can be easily matched to the colors and patterns found in other furniture. The quality and price of ottomans are determined by their material and construction. Most upholstered ottomans are made of leather or polyester with wood-finished bases. Leather is resistant to wear, yet pricier than microfiber upholstery, such as polyester. While inexpensive, soft and appealing, pieces crafted with polyester cannot withstand the same amount of use as leather.